Neil Armstrong is, as anyone educated outside of the United States knows, the first man on the moon. For some bizarre reason, most Americans appear to have conflated an old OJ Simpson movie with actual fact, and believe that Neil never actually left a Hollywood Basement, but, hey, there's 50 years of crappy educational policy for you. Fortunately, people in other countries tend to remember important stuff for us these days, since we can't be bothered. REALSPACE: Is there is or is there ain't? Thanks to president Obama, we're unlikely to get an answer to this question in our lifetimes, but scientists are once again saying there's water on the moon. This debate goes back and forth quite a bit - there is, there isn't, there is, there isn't, you're a jerk, your mom says you're a jerk, you mom says I'm good in bed, and then the punches begin flying - but short of actually going there, we'll never know. Read more about REALSPACE: Is there is or is there ain't? As everyone knows, the Space Shuttle program is being retired at the end of this year. As everyone probably knows (or at least should know), President Bush the Younger openly addressed the fact that America hasn’t really been doing anything significant in space in thirty or so years, and it was time for us to get off our butts and strive again. His dad, George Senior, attempted something similar, but was summarily slapped down by congress. George Junior, however, managed to get the program passed with a surprisingly solid bipartisan support. 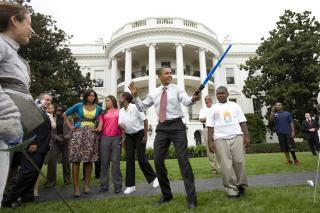 REALSPACE: Obama’s Vision For Space Exploration. Haven't we seen this before? One aspect of the President’s administration that mystifies me, and which I don’t think gets as much press as it really should is his opinion on the Space Program and/or NASA (Arguably, the two are not the same). This is a mistake that our children will still be paying for thirty years from now. Read more about REALSPACE: Obama’s Vision For Space Exploration. Haven't we seen this before? Not too long ago, I wrote a little article online here about how our Space Program is screwed, since Obama seems to oppose it. (That article http://www.republibot.com/content/realspace-things-are-looking-really-ba... ) Project Constellation is, of course, our attempt to get rid of this guilded turd that the Nixon administration saddled us with, and which we've been pointlessly flying - and killing people with - for very nearly a generation now (1981-2009). I’m not one to reflexively attack our president simply because he’s a Democrat. In fact, I’m not one to reflexively attack our president at all. Love him or hate him, he’s the president, after all, and deserving of our respect. And I’ll confess that while I flagrantly disagree with his economic policies, I am actually proud to have lived to see our first black president, which, let’s face it, is a huge step forward in the cultural evolution of our nation, the kind of thing that would have been unthinkable only twenty years ago. And he’s even surprised me on occasion.